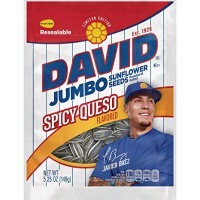 Bring some South-of-the-Border spice to this years’ baseball season. 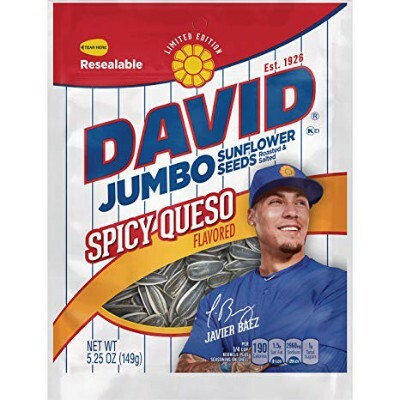 David Jumbo Sunflower Seeds Spicy Queso Flavor feature delicious shelled sunflower seeds coated in a spicy and satisfying queso flavor- they’re ideal for a road trip snack, or a quirky snack at your next apéro. Sunflower seeds, salt, high oleic canola oil, less than 2% of: organic whey, cayenne pepper sauce (aged cayenne red peppers, vinegar, salt, garlic), spices, cheddar cheese (pasteurized milk, cheese cultures, salt, enzymes), green bell pepper powder, garlic powder, acidity regulator E270, onion powder, organic cream, organic nonfat dry milk, yeast extract, acidity regulator E330, corn starch, natural flavor including smoke, milk. Contains GMO. Nutrition facts (for 100g): calories 633Kcal, total fat 53.3g (saturated fat 5g), total carbohydrate 16.7g (sugar 3.3g), protein 23.3g, salt 24.7g.